I’ve had the idea of making a potato salad with blue cheese and bacon for some time now, so it stands to reason that I would inevitably make it as a part of my #100DaysofSalad project where I am making and sharing (at least on Instagram) 100 different salads for 100 consecutive days. In the time that it takes you to boil the water for the potatoes, you can crisp the bacon and make the dressing. I used balsamic vinegar for this salad, because I think it goes nicely with the Gorgonzola I had, but white-wine or champagne vinegar will work just as nicely. I put half of the cheese in while the potatoes are still warm, which helps it melt into the dressing. Then, I sprinkle the other half of the cheese once the salad is complete for the contrast in color. Start by placing the potatoes in a pot large enough to cover the potatoes with 2 inches of water. Cover and cook on high. Once the water starts boiling reduce the heat to medium and continue cooking for about 15-20 minutes, or until the potatoes can be easily pierced with a sharp knife or skewer. Meanwhile, cook the bacon and make the dressing. To cook the bacon, heat a skillet over medium-high heat. Add the bacon and coo, until brown and crispy. Remember, the bacon with crisp as it cools. Remove the bacon from the pan and onto a plate lined with paper towel. To make the dressing add the olive oil, balsamic vinegar, sea salt and pepper to a medium-sized mixing bowl. Whisk to combine the ingredients. When the potatoes have fully cooked, drain the water and allow the potatoes to cool slightly, about 7-10 minutes. Then, carefully cut each potato into halve or quarters, depending on how large your potatoes are — go for large, bit-sized pieces. 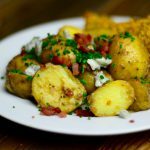 Place the cut potatoes into the bowl of dressing. Then, add the bacon and half of the blue cheese. Carefully stir the potatoes, covering them in dressing. 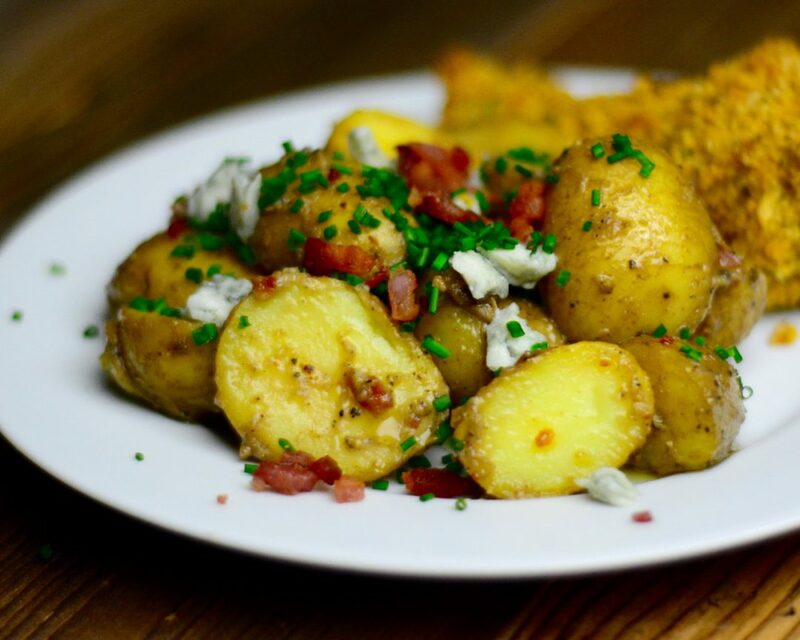 The heat from the potatoes will melt some the blue cheese in the dressing. Once the potatoes have cooled add the chopped chives and the remaining blue cheese. Give the salad one final, gentle toss and serve. Allow the salad to cool before adding the chives otherwise, the heat will brown the chives.